Deal-making used to be done in smoke-filled rooms. Now it will be done in a cabinet room filled with the smell of big oil. The parallels between the war on tobacco half a century ago and the current war on fossil fuel consumption are astonishingly close. During the 1960s, my brief flirtation with smoking was typical teenage behavior. The adults we modeled ourselves after were seldom seen without something burning in their hands. Little did I know then that the tobacco companies were actively promoting a habit they knew to be dangerous, and were fraudulently hiding the truth about medical and societal costs. Eventually they were identified, tried, convicted and punished. Something eerily similar appears to be taking place with petroleum. Last week, the attorneys general of Massachusetts and New York won a ruling against Exxon Mobil Corp. Suffolk County Judge Heidi Brieger ruled that the company must release 40 years worth of internal records related to climate change as part of a fraud investigation. On that very day, Exxon Mobil’s CEO, Rex Tillerson, was refusing to answer questions about climate change being put to him by the U.S. Senate, which was grilling him as President-elect Donald Trump’s nominee for secretary of state. As with the tobacco trials of yore, state attorneys general are investigating a deliberate cover-up, and the target corporation is responding with aggressive countersuits. This is actually very old news. Seven years ago, Erik Conway and Naomi Oreskes highlighted the historic parallels between big tobacco and big oil in their powerful book “Merchants of Doubt.” The alleged common thread between these industries is the use of corporate power to actively promulgate disinformation. Another common thread is the claim by both that they’re merely meeting a market demand, rather than creating one. Though the oil companies did not push us into oil addiction the way the tobacco companies did, they were certainly complicit in the process. Within a half-century, American culture was hopelessly addicted to petroleum for space heating, electrical generation, military applications and most important, the personal automobile. Car culture gradually became part of our national infrastructure in the form of personal garages, interstate highways, vast suburbs, multi-lane bridges, drive-in movies, shopping malls, urban parking garages, drive-through fast food restaurants and many others. Heede is an independent “carbon accountant” whose office is a rented houseboat in Sausalito, Calif., in San Francisco Bay. His accounting is a remarkable, unprecedented story of dogged perseverance and number crunching that’s detailed in the Aug. 25, 2016, “Science.” It covers Heede’s 2013 report that nearly two-thirds of our cumulative global carbon emissions came from just 90 companies, eight of which are responsible for 20 percent of the total. Third on that list of global polluters is Exxon Mobil. Fifth is Russia’s state-controlled Gazprom. It’s no wonder that Rex Tillerson and Vladimir Putin are close comrades. For all practical purposes, they are in the process of becoming co-defendants in the largest class action suit ever: a case of 7 billion world citizens vs. 20 powerful companies. The direct link between petroleum and political power has never been more clear to me. The source of that power is an addiction to fossil fuels that’s been promulgated by the energy companies and the states that support them. Under the Obama administration we made great progress kicking the fossil fuel habit. This trend must continue, not because climate change is bad in and of itself, but because the human-created disruptions are already wreaking havoc. With tobacco, the harm was breathed inward to our lungs. With fossil fuels, the harm is being breathed outward into Earth’s lung, our atmosphere. Robert M. Thorson is a professor at the University of Connecticut’s College of Liberal Arts and Sciences. His column appears every other Thursday. He can be reached at profthorson@yahoo.com. Can ExxonMobil Be Found Liable for Misleading the Public on Climate Change? Scientists at the biggest U.S. oil company understood as early as anyone that fossil fuel emissions were heating up the earth’s atmosphere. Kenneth Cohen, then the company’s vice president for public and government affairs, convened near-daily meetings to form a response. “We all sat around the table and said, ‘This feels very orchestrated,’ ” says Suzanne McCarron, who succeeded Cohen when he retired at the end of last year. McCarron still seems shocked that her company could come under sustained attack. “We wanted to know who’s behind this thing,” she says. While Exxon tried to identify its new nemesis—made difficult, perhaps, by the release of the two reports being coincidental—the executives also decided to nitpick the journalism and sent lobbyists to Capitol Hill to argue their side. That didn’t go so well. “I couldn’t get any journalist to actually evaluate the coverage,” Exxon spokesman Alan Jeffers says, with evident frustration. The crisis might have died down, a week or two of bad PR and nothing more, but several politicians saw an opening. On Oct. 14, four weeks after the first InsideClimate report, Democratic Representatives Ted Lieu and Mark DeSaulnier, both from California, asked U.S. Attorney General Loretta Lynch to launch a federal racketeering investigation of Exxon. “It occurred to me that this looks like what happened with the tobacco companies a decade ago,” Lieu says. Democratic presidential candidate Hillary Clinton added her support for a Department of Justice inquiry. “There’s a lot of evidence that they [Exxon] misled people,” she said two weeks later. Stoked by 40 of the nation’s best-known environmental and liberal social-justice groups—including the Environmental Defense Fund, Sierra Club, and Natural Resources Defense Council—the anti-Exxon animus only intensified. And if there wasn’t a coordinated campaign before, now there was: The groups all signed an Oct. 30 letter to Lynch also demanding a racketeering probe. (Lynch has since asked the FBI to examine whether the federal government should undertake such an investigation.) The same day, Lieu and DeSaulnier tried to interest the Securities and Exchange Commission in a fraud probe against Exxon, a request that’s pending. Five days later, on Nov. 4, New York Attorney General Eric Schneiderman opened a formal investigation into whether Exxon had misled investors and regulators about climate change. “We cannot continue to allow the fossil fuel industry to treat our atmosphere like an open sewer or mislead the public about the impact they have on the health of our people and the health of our planet,” former Vice President Al Gore said at a subsequent news conference organized by Schneiderman. Compelled by the New York AG’s subpoena, Exxon has so far turned over some 1 million pages of internal documents. Hours after Schneiderman issued his subpoena, Exxon Chief Executive Officer Rex Tillerson went on Fox Business Network. “The charges are pretty unfounded, without any substance at all,” he said. “And they’re dealing with a period of time that happened decades ago, so there’s a lot I could say about it. I’m not sure how helpful it would be for me to talk about it.” These remarks themselves weren’t terribly helpful—certainly not to Tillerson’s company. Most important, though, #ExxonKnew comes as climate change, after being on a legislative back burner, has gotten hot again. Signs of this include President Obama’s rejection last November of the Keystone pipeline from western Canada, the Paris summit in December that produced an international agreement to lower greenhouse gas emissions, and the U.S.-China plan, finalized on Sept. 3, committing the world’s two largest economies to implement the Paris accords. It’s too soon to say how much of a danger Schneiderman’s investigation poses to Exxon or if the corporation will ever be charged billions of dollars for carbon pollution. But it can’t ignore the risk of the sort of litigation storm that engulfed Big Tobacco in the 1990s. ExxonMobil doesn’t want to become the Philip Morris of climate liability. #ExxonKnew has taken shape over the past year, but Peter Frumhoff traces its roots to January 2007. That’s when the Union of Concerned Scientists, a Cambridge, Mass.-based nonprofit, published a 64-page report alleging that Exxon used the cigarette industry’s tactics to “manufacture uncertainty on climate change.” Founded in 1969 by physicists worried about nuclear issues, the UCS has branched out over the years. Frumhoff, a 59-year-old Ph.D. ecologist, serves as its director for science and policy. He dresses in grad-school casual and seems highly amused by Exxon’s notion that he’s a central player in a conspiracy against the company. For starters, Frumhoff is a snap to track down and operates quite openly—violations of the conspirator’s imperative to plot in secret. The 2007 report, which Frumhoff oversaw, compared Exxon to cigarette manufacturers that only five months earlier had been found liable by a U.S. district judge for violating the federal Racketeer Influenced and Corrupt Organizations Act (RICO). “ExxonMobil has underwritten the most sophisticated and successful disinformation campaign since Big Tobacco misled the public about the incontrovertible scientific evidence linking smoking to lung cancer and heart disease,” the report asserted. Several more years passed before a passel of climate documents surfaced, not courtesy of a prosecutor’s subpoena, but as a result of journalistic digging: those reports in InsideClimate (21,000 words in length) and the Los Angeles Times. The two organizations reported that after accumulating climate knowledge for a decade or so, Exxon changed course beginning in the late 1980s, just as public debate over greenhouse gas emissions heated up. Working separately from InsideClimate, the Los Angeles Times showed how Exxon incorporated climate change projections into its Arctic exploration plans in the 1990s while publicly undermining such projections. The overlapping investigative journalism efforts appeared as delegations from countries around the world were getting ready for the December climate talks in Paris. On the sidelines of the Paris summit, McKibben, the author-activist, co-hosted a mock trial of Exxon in which he served as a prosecutor. “This is not just some run-of-the-mill, usual corporate malfeasance,” McKibben said at the trial. “It’s hard to imagine a set of corporate practices that could have done more damage.” Exxon, needless to say, was found guilty. By its public-relations staff’s own admission, Exxon spent last fall and winter in a largely reactive mode, scrambling to respond to each new revelation or congressional request for an investigation—and never succeeding in offering an alternative narrative. “It was like playing whack-a-mole,” spokesman Jeffers says. Seeking to illustrate how InsideClimate “cherry-picked” evidence, the company’s communications team pointed Bloomberg Businessweek to a half-dozen alleged examples. Exxon has also accused InsideClimate and the Los Angeles Times of having financial conflicts of interest. The Times articles were researched and written in collaboration with an environmental-reporting project at Columbia University’s Graduate School of Journalism, and that program has taken substantial grants from environmentally oriented foundations, such as those funded by the Rockefeller family. Despite the source of their original wealth—in 1870, John D. Rockefeller created Standard Oil, the corporate forerunner of Exxon—the Rockefeller charities in recent years have taken strong stands against the fossil fuel industry. The Rockefeller Family Fund gave Columbia Journalism School $550,000 to help pay for its fossil fuel reporting project but exercised no editorial control, says Lee Wasserman, director of the fund. The Los Angeles Times initially failed to disclose the funding of the Columbia reporting project, though the newspaper eventually linked to the financial details online. Since 2013, the separate Rockefeller Brothers Fund has provided InsideClimate with $200,000 a year; that fund had no say over what the website published, according to David Sassoon, InsideClimate’s founder and publisher. 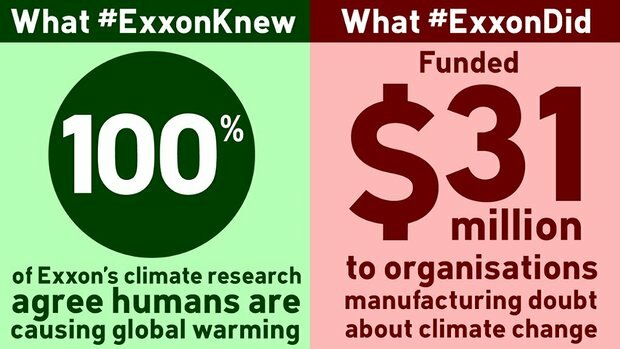 Strictly speaking, though, #ExxonKnew isn’t a campaign aimed at what the company is saying or doing today. #ExxonKnew focuses on discrepancies between past actions and past statements. That historical inquiry, Lieu says, deserves the authority and force of a government investigation. Exxon’s lobbyists didn’t change his mind. Schneiderman also arranged for private briefings for the visiting AGs. These closed-door sessions featured a talk on climate science by Frumhoff and a legal backgrounder by Matt Pawa, a private plaintiffs’ attorney who in 2013 won a $236 million groundwater-pollution verdict against Exxon. The company’s public-affairs representatives see great significance in Pawa’s also having attended Frumhoff’s 2012 gathering in La Jolla. “You see the same people showing up at planning meetings over the years,” Jeffers says. Schneiderman says he doesn’t know anything about the La Jolla session and that his office routinely consults with outside experts. A more consequential aspect of the prosecutors’ conclave was the announcement by the attorney general of the U.S. Virgin Islands, Claude Walker, that his tiny Caribbean territory had launched a parallel investigation of Exxon. In theory, the Virgin Islands has ample reason to be anxious about climate change: Warming, rising ocean waters could swamp its homes and resorts in coming decades. But in practice, the territory proved itself inadequate to the task of confronting Exxon. Finally, Exxon had its counterpunch: that hostile outsiders had attacked the company’s free-speech rights. There’s a reason Theodore Wells, the Paul Weiss partner who’s led Exxon’s legal defense (and has represented such clients as Philip Morris), is known as one of the craftiest people in his profession. However unlikely the image of Exxon as victim, that’s how Wells decided to characterize his client—and it worked. On April 22, the Washington Post carried two opinion pieces on the topic: a column by George Will headlined “Scientific Silencers on the Left Are Trying to Shut Down Climate Skepticism” and one by Sam Kazman and Kent Lassman, respectively general counsel and president of the Competitive Enterprise Institute, condemning “the environmental campaign that punishes free speech.” In the following days, dozens of similar broadsides were issued from the Wall Street Journal editorial page, Fox News, the Heritage Foundation, and many others. Once again, politicians followed. In mid-May, the House Committee on Science, Space, & Technology began investigating what it called “a coordinated attempt to deprive companies, nonprofit organizations, and scientists of their First Amendment rights.” The only company the panel mentioned by name was Exxon. 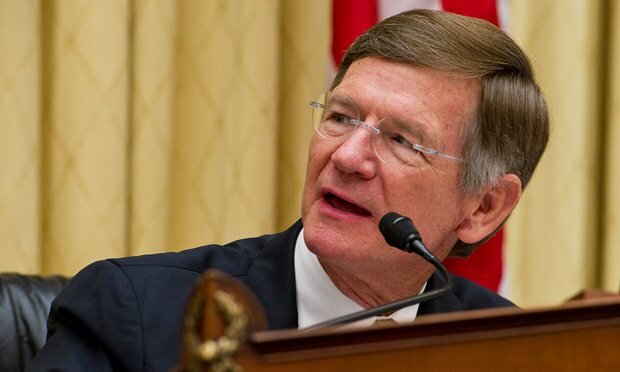 Committee staff members and Exxon’s McCarron say that despite the company’s widespread lobbying of Congress, it didn’t ask the panel or its chairman, Lamar Smith (R-Texas), to begin the probe. First elected in 1986, Smith has received almost $685,000 in career campaign contributions from the oil and gas industry, according to the Center for Responsive Politics. By early July, the Virgin Islands had turned tail and withdrawn its subpoenas of Exxon and the Competitive Enterprise Institute. Trying to put the best spin on his humiliating retreat, Virgin Islands AG Walker said via e-mail that extricating itself from the subpoena imbroglio will allow his office to “use our limited resources to address the many other issues that face the Virgin Islands and its residents.” Wells didn’t respond to requests for comment. One potential defense that Exxon is floating: Since the 1970s its scientists have published climate findings in more than 50 peer-reviewed articles. What Exxon knew, the argument would go, the wider scientific world also knew. The company didn’t keep secrets the way the tobacco industry did. Few complicated securities-fraud cases go to trial; the risk of losing and the costs of extended litigation impel settlement. With those risks in mind, Exxon and New York may eventually look to a separate case resolved by Schneiderman’s office in November. The attorney general found after a two-year investigation that coal producer Peabody Energy provided incomplete information to investors by saying in public reports that it couldn’t “reasonably predict” the risks it faced from climate-related regulations. St. Louis-based Peabody, which in April declared bankruptcy amid a collapsing coal market, neither admitted nor denied wrongdoing and didn’t face pecuniary punishment. The company did agree to provide more forthcoming disclosures to investors. “It’s really too soon to tell” whether the Peabody settlement provides a model for the Exxon case, Schneiderman says. He expects to amass evidence in the Exxon investigation of “a much more sophisticated ongoing policy of deception” than what his office found inside Peabody—wrongdoing that could warrant seeking substantial money damages. Exxon has kept that alleged policy in place through recent years, Schneiderman says, pointing to a 2014 company report claiming that international efforts to reduce climate change wouldn’t oblige fossil fuel producers to leave enormous amounts of oil in the ground untouched. In a major blow to ExxonMobil, documents reveal that the common tactical playbook is decades older than previously assumed. A recent analysis of more than 100 industry documents conducted by the Center for International Environmental Law (CIEL), a Washington, D.C.-based advocacy group, has revealed that the oil industry knew of the risks its business posed to the global climate decades before originally suspected. It has also long been assumed that, in its efforts to deceive investors and the public about the negative impact its business has on the environment, Big Oil borrowed Big Tobacco’s so-called tactical “playbook.” But these documents indicate that infamous playbook appears to have actually originated within the oil industry itself. If that is true, it would be highly significant—and damning for Big Oil—because the tactics used by the tobacco industry to downplay the connection between smoking and cancer were eventually deemed to have violated federal racketeering laws by a federal court. The ruling dashed efforts by Big Tobacco to find legal cover under the First Amendment, which just happens to be the same strategy that ExxonMobil and its GOP allies are currently using to defend the company against allegations of fraud. If the playbook was in fact created by the oil and gas industry and then later used by ExxonMobil, it ruins the company’s argument of plausible deniability, making it highly likely that the company violated federal law. This latest development is a major blow to Big Oil, which has been trying to rebuff comparisons to the tobacco industry. It also comes as a group of state attorneys general are pursuing an investigation into possible fraud committed by ExxonMobil. The probe, which could ultimately extend to include other oil and gas companies, was launched in November by New York State Attorney General Eric Schneiderman, who has since been joined by 16 other state AGs in a historic national coalition seeking to find out if America’s largest oil company intentionally hid critical climate-related information about their future business from investors and the public. Environmentalists and corporate accountability advocates have cheered the investigation, contending that ExxonMobil has engaged in a decades-long campaign of climate denial and deception, ultimately delaying action on climate change and putting the planet at risk. “Big Oil created the organized apparatus of doubt,” Muffett said. “It used the same playbook of misinformation, obfuscation and research laundered through front groups to attack science and sow uncertainty on lead, on smog, and in the early debates on climate change. Big Tobacco used and refined that playbook for decades in its fight to keep us smoking—just as Big Oil is using it now, again, to keep us burning fossil fuels.” To wit: Exxon’s own Corporate Citizenship Report from last year revealed that the company is still funding climate denial groups. The documents suggest that the tactics in question were developed by the Smoke and Fumes Committee, a group launched 70 years ago by the American Petroleum Institute, the national trade association that represents the U.S. fossil fuel industry, to study oil industry pollution and present its own spin to the public. If that is the case, it appears those same tactics were likely co-opted by the tobacco industry, which was later found guilty of committing fraud following a racketeering lawsuit filed in 1999 by the Department of Justice. The documents reveals that the deceptive actions taken by the oil industry so many decades ago prevented the possibility of early action on climate change—action that may have prevented potentially millions of climate-related deaths across the globe. According to the Centers for Disease Control and Prevention, cigarette smoking is responsible for more than 480,000 deaths per year in the United States alone. The World Health Organization estimates that around 6 million people worldwide die from tobacco-related illnesses. Between 2030 and 2050, WHO estimates that climate change will cause approximately 250,000 deaths per year, from heat stress, malnutrition, malaria and diarrhea. That number does not include the deaths caused by climate-related natural disasters, which have more than tripled since the 1960s, resulting in over 60,000 deaths each year, mainly in developing countries. In the large picture … tobacco and fossil fuel emissions are quite different. Tobacco kills people one by one. Climate change will increasingly cause events like hurricanes that will destroy large swathes of property, kill numbers of people, make many homeless. While it can be argued that smoking tobacco is a matter of individual choice, the production and use of fossil fuels is more obviously a social issue. In the long run, producers of fossil fuels will have to lose. The only question is how much the people and ecologies of the world will lose before our economies cease to make the situation worse. While the climate situation can certainly become worse, the actions of ExxonMobil and Big Oil have helped to put the planet on what many scientists are now saying is an unstoppable path. In 2014, the United Nations’ Intergovernmental Panel on Climate Change offered a grim assessment: “Continued emission of greenhouse gases will cause further warming and long-lasting changes in all components of the climate system, increasing the likelihood of severe, pervasive and irreversible impacts.” That has left environmentalists not only angry at the oil industry, but also wondering how the narrative might have been different had the industry been honest and open about its early findings. Climate activist Bill McKibben, the founder of 350.org, has been a long-time critic of the oil and gas industry. “The ongoing revelations about the depth of oil industry research into—and obfuscation of—the greatest crisis humans have ever faced are hard to read; thanks to them, we wasted vital time,” he said in a press statement. Notably, Muffett said, is the fact that the report’s authors “recognized that the most important remaining uncertainties were technological: How would we respond and how would we modify our technology to reduce emissions?” Now, nearly half a century later, the question becomes: Why did the oil industry hide this information from the public? Of course, we know the answer to that question: Profits. Instead of responding responsibly to the dire warnings that came with this information by moving the nation’s energy portfolio and infrastructure to a low-carbon future, the oil industry kept on drilling, kept businesses and consumers burning their primary retail products, which continued to pollute the environment and damage the Earth’s climate. The question for Schneiderman and his fellow state attorneys general is, did ExxonMobil, and possibly other oil companies, intentionally mislead investors, consumer and the public, hiding the damning scientific evidence that their own industry paid to discover? With CIEL’s analysis of industry documents, it appears that Big Oil may be even guiltier than originally suspected, as the group traced the origins of the 1968 API report to a meeting of oil and gas industry executives in Los Angeles more than two decades earlier, in 1946. One of the tactics used by the oil industry was to delay any climate action that might harm its business by sowing seeds of doubt. “The worst thing that can happen, in many instances, is the hasty passage of a law or laws for the control of a given air pollution situation,” wrote Vance Jenkins, executive secretary of the Smoke and Fumes Committee, in a 1954 trade journal article about smog pollution. The ties between the oil and tobacco industries run deep. In the 1950s, Monroe J. Rathbone, the president and director of Standard Oil, sat on American Cancer Society’s committee on smoking and public policy. In 1968, Esso Research and Engineering Co., an affiliate of Standard Oil, filed a patent claim for a new type of cigarette filter, made out of polypropylene, a thermoplastic polymer that was first synthesized by Phillips Petroleum, an American Oil Company. In 1979, R.G Baker, the chair of British American Tobacco, the second largest tobacco company in the world, also sat on the board of Exxon, the world’s biggest publicly traded oil company. In the 1970s, R.J. Reynolds, America’s second-largest tobacco company, diversified into the energy business, acquiring American Independent Oil Company, Burmah Oil and Gas Company and Burmah Oil Development, Inc.
As evidence mounts of the oil industry’s decades-long campaign of climate deception and denial, Exxon and its allies assure us that oil is not the new tobacco. The 14 million documents at the Tobacco Archives prove Exxon right: Oil is not the new tobacco. But six decades ago, tobacco was the new oil. In December 1953, tobacco executives met in a New York hotel room to hatch a plan to confront the rising tide of science linking smoking with cancer. To help craft that plan, tobacco turned to PR firm Hill and Knowlton. Hill and Knowlton, in turn, drew on its long expertise supporting the oil industry. Richard Darrow, the principal architect of tobacco’s strategy, also represented Hill and Knowlton’s biggest oil company clients. In the years that followed, the tobacco conspirators looked repeatedly to oil industry campaigns on smog, lead and other air pollutants for models, for resources and for people. They turned to Stanford Research Institute, a key player in the oil industry’s “Smoke and Fumes” effort to develop a suitcase-sized testing kit that would sample smoke without attracting attention. They turned to Truesdail Laboratories, which in 1958 was doing the earliest documented climate research for the American Petroleum Institute, and to a former Standard Oil executive who recommended an array of scientists for the tobacco industry’s scientific advisory board, nearly all with proven links to the oil industry and many of whom would go on to work for tobacco. ExxonMobil and its allies on Capitol Hill—a coterie of GOP legislators who have received political contributions from the oil industry—have attempted to stop the AGs’ fraud probe by claiming the investigation is a violation of the company’s First Amendment rights. Unfortunately for ExxonMobil, the First Amendment claim has already been discredited. In United States vs Philip Morris Inc., a federal appeals court found that the First Amendment does not protect fraudulent statements. Likewise, Healey’s office has dismissed ExxonMobil’s claims. “For many months, ExxonMobil has engaged in an unprecedented effort to limit the ability of state attorneys general to investigate fraud and unfair business practices,” said Cyndi Roy Gonzalez, Healey’s communications director. However, a similar battle between ExxonMobil and U.S. Virgin Islands Attorney General Claude Walker ended in a ceasefire, as Walker agreed to withdraw a similar subpoena in exchange for ExxonMobil’s withdrawal of its lawsuit against him. Walker’s withdrawal hasn’t been viewed as a setback for the ongoing probe, as legal experts contend that the primary battlefields will be Massachusetts and New York. So far, Exxon is cooperating with New York’s investigation and has already relinquished more than 700,000 pages of documents to Schneiderman’s office. But 100 or so recently analyzed documents may reveal the true origin of Big Tobacco’s infamous playbook. US energy giant ExxonMobil today revealed a 59% drop in second quarter earnings, blaming low crude prices and weak returns from refining. ExxonMobil said its global upstream earnings slumped 82% year-on-year to $294million (£223million) during the three months. Downstream earnings came to £625million, down £516million from the second quarter of 2015. But ExxonMobil, which has an interest in about 40 producing North Sea oil and gas fields, said it posted slight increases in oil production and sales in Europe. Global production volumes held firm at 4 million barrels of oil equivalent (boe) per day and income from chemical remained strong at £910million. The company also managed to cut its spending by 38% to £3.9billion during the period. It ended the quarter with net earnings of £1.29billion compared to £3.18billion a year ago. And ExxonMobil booked pre-tax profits of £1.8billion, down 65% year-on-year, on revenues of £44billion. Rex Tillerson, chairman and chief executive officer, said: “While our financial results reflect a volatile industry environment, we remains focused on business fundamentals, cost discipline and advancing selective new investments across the value chain to extend our competitive advantage. ExxonMobil paid out £2.3billion in dividends to shareholders. The company employs more than 6,500 employees and 1,500 contractors in the UK and has a base in Aberdeen. Over the past several months, The Ring of Fire and other Progressive media outlets have reported on how Big Oil (particularly Exxon-Mobil) has been covering up evidence of climate change since the 1970s. It turns out that the cover up has been going on far longer. In fact, Exxon-Mobil’s corporate ancestor, Humble Oil, was manipulating scientific information in order to influence public opinion as long ago as the 1940s. It’s similar to the way Big Tobacco had been covering its own rear end since medical science started making connection between smoking and lung cancer in the 1930s. Similarities between the two are no coincidence. Egregiously, these two corporate criminal enterprises were sharing marketing strategies and methods of spreading disinformation for decades. On the surface, it would appear that Big Oil and Big Tobacco are unlikely corporate bedfellows. But consider that convenience stores represent a major retail outlet for both cigarettes and other tobacco products and gasoline. Since they are a high-markup item, the oil companies that kept cigarette vending machines back in the day were anxious to preserve their profits. It was a textbook case of a symbiotic relationship. This lurid tale has been uncovered by the Center for International Environmental Law (CIEL) in Washington D.C.. A short documentary film produced by the organization tells the story of the entangled relationship between Big Oil and Big Tobacco. It is a relationship that dates back more than sixty years. Back in the 1950s, Monroe Rathbone, head of Standard Oil (another one of Exxon-Mobil’s corporate forebears) was also on the board of the American Cancer Society’s Committee on Smoking and Public Policy. At the same time, oil companies – in which tobacco companies held financial interests and vice-versa – were developing cigarette filters and sharing testing methods. It doesn’t take a genius to see the clear conflicts of interest here, and it doesn’t stop there. What is even more unforgivable is that the oil industry had the technology to reduce and eventually eliminate CO2 emissions in 1963! On December 31st of that year, yet another of Exxon-Mobil’s corporate predecessors, Esso, filed Patent #3,116,169 with the U.S. Patent Office for “Fuel Cell and Fuel Electrodes.” The device was a catalyst, using oxygen to produce clean, efficient electrical energy. “THERE IS NO DOUBT THAT INCREASES IN FOSSIL FUEL USAGE AND DECREASES OF FOREST COVER ARE AGGRAVATING THE POTENTIAL PROBLEM OF INCREASED CO2 IN THE ATMOSPHERE. TECHNOLOGY EXISTS TO REMOVE CO2 FROM STACK GASES BUT REMOVAL OF ONLY 50% OF THE CO2 WOULD DOUBLE THE COST OF POWER GENERATION,” [EMPHASIS ADDED]. It’s simple; It was cheaper and more profitable to keep on drilling. Instead of exploring and investing in ways to mitigate and reverse the massive environmental damage they knew their product was causing, Exxon-Mobil and its partners in crime poured their resources into ways of adapting – new, taller oil rigs, for example, that could withstand rising sea levels, as well as insane and unworkable ideas to control the climate. One of these ideas – on which Exxon actually filed a patent – was to literally pave over large, dry regions of the planet in order to create heat and increase rainfall. That brilliant idea was developed by one of Exxon’s own scientific advisers, James Black. Black was one of the scientists who warned the industry of the impact of fossil fuels on climate, but his solution was essentially more of the same (of course, what else would he tell the people who signed his paycheck?). Another great plan was to spray black carbon into the air in order to create winds that would simply blow away the smog. It must not have occurred to the folks at Exxon that even if such an idea was workable, the smog would have to go somewhere. And of course, there was money to made; after all, asphalt is a petroleum product. Furthermore, while the industry would be internalizing all those profits, they would be able to saddle the rest of us with the costs by getting rid of noxious wastes on the cheap. Today, we are all paying the price for this insanity. And how does this all relate to the relationship between Big Oil and Big Tobacco? Basically, it was a marriage of convenience, but hardly a love affair. To be sure, the two shared common financial interests. But there was more to it. With the increase in the cancer rate in the latter part of the 20th Century, the tobacco and oil industries began pointing fingers at each other. According to Muffet, Big Tobacco had an obsession with Big Oil that “bordered on paranoia.” As the two industries watched each other, they came up with new and creative methods of “plausible denial” and ways to confuse and mislead the public. Between that and the way the industries have bought off lawmakers over the decades, little has been done to address the disastrous consequences to public health. Now that the evidence has come out and CIEL has released documentation for the world to see, will there be consequences? In July of 2014, a Florida woman was awarded $23.6 billion in a lawsuit against tobacco giant R.J. Reynolds. That was only the most recent victory in a long battle to hold Big Tobacco accountable. Late last year, the State of New York started a major investigation into Exxon-Mobil’s deception of the public over the climate change issue. As of March, 17 more attorneys general have joined the investigation. Then, this past May, the Massachusetts-based Conservation Law Foundation began legal action against the oil company juggernaut over pollutants leaked into the confluence of the Mystic Island End Rivers from one of its terminals. It is the first lawsuit to link a localized incident to the broader threat of global climate change and the oil industry’s culpability. Big Oil is a different animal. Not only does it have more resources than big tobacco, it sells a product that runs so much of society’s machinery. Nonetheless, the opening salvos in what promises to be a long, hard battle have been fired. As people wake up to the gargantuan lies that Exxon-Mobil has fed them for over half a century, and as they realize that a “Corporate Person” was willing to put the entire future of humanity at risk for the sake of making a few extra billion dollars, it’s a good bet that the day of reckoning will come. We can only hope that it comes in time. Organizations worried about climate change have long drawn comparisons between the petroleum and tobacco industries, arguing that each has minimized public health damages of its products to operate unchecked. Some have urged federal regulators to prosecute oil companies under racketeering charges, as the Department of Justice did in 1999 in a case against Philip Morris and other major tobacco brands. Oil companies bristle at the comparison. But overlap between both industries existed as early as the 1950s, new research details. Documents housed at the University of California, San Francisco, and analyzed in recent months by the Center for International Environmental Law (CIEL), a Washington, D.C.-based advocacy group, show that the oil and tobacco industries have been linked for decades. The files CIEL drew its research from have been public for years. The unknown author of one memo, who once worked for Standard Oil Co. Inc. of New Jersey, suggested scientists for an advisory committee study the health effects of smoking. “I am giving below the names of individuals who you might consider as potential members of the Medical Advisory Committee for the tobacco industry, as related to its current medical problem,” the person wrote to a tobacco research board, alluding to building evidence that smoking caused health problems. Both industries hired public relations company Hill & Knowlton Inc., an influential New York firm, for outreach as early as 1956. And Theodor Sterling, a mathematics professor known for research on smoking that was favorable to the tobacco industry—Philip Morris paid more than $200,000 in the 1990s for his work—also studied lead in gasoline for Ethyl Corp. in 1962. Ethyl was a joint venture between General Motors Corp. and Standard Oil. “From the 1950s onward, the oil and tobacco firms were using not only the same PR firms and same research institutes, but many of the same researchers,” CIEL President Carroll Muffett said in a statement. CIEL alerted ClimateWire to the existence of the tobacco documents and has been researching for years what the oil industry knew about climate change and what it did in response. The group’s new research is part of a building debate about oil companies’ knowledge over the decades about climate change. It also is part of a push from environmental groups to make the legal case that fossil energy companies have lied for decades about global warming risks, just as tobacco companies lied about the connection between smoking and cancer. Smith and his colleagues maintain that the attorneys general colluded with environmentalists in their investigations. They say such probes violate First Amendment protections of free speech. Another connection between oil and tobacco companies, according to CIEL, is the Stanford Research Institute, now known as SRI International after splitting with Stanford University in 1970. Founded in 1946, SRI studied smog and pollution generally and received funding from tobacco and oil companies. SRI scientists also generated climate change research for the American Petroleum Institute in the 1960s and ‘70s. Spokespeople for Chevron Corp., Exxon Mobil and Royal Dutch Shell PLC said they hadn’t heard of the Stanford Research Institute before, declining to comment further. And API spokesmen did not respond to request for comment. A blog post from the Independent Petroleum Association of America called the document release a “desperate move” and the latest in a coordinated attempt to hurt the fossil fuel industry. “If the earth’s temperatures increase significantly, a number of events might be expected to occur, including the melting of the Antarctic ice cap, a rise in sea levels, warming of the oceans, and an increase in photosynthesis,” they wrote. Robinson followed up in an API-commissioned study dated 1971. “If there were a long term and significant increase in the pollutant content of the atmosphere either of particles or of carbon dioxide, the potential damage to the global environment could be severe,” he said. “Even the remote possibility of such an occurrence justifies concern,” added Robinson, one of the first scientists to link the burning of fossil fuels with global warming. He died earlier this year at 91. The documents show oil companies tested toxicity in cigarettes in the 1950s, and some, including Exxon and Shell, patented cigarette filters worldwide for decades. They also indicate that tobacco companies went to SRI for help in creating small testing kits the size of suitcases to assess smoke. In 1946, API established its own body to study pollution from the oil industry. It was called the Smoke and Fumes Committee. Wary of government regulation to slash pollution from refineries and other operations within their supply chain, as well as public concern about smog in cities such as Los Angeles, petroleum officials at API and member firms offered alternative theories of how smog was created. “The worst thing that can happen, in many instances, is the hasty passage of a law or laws for the control of a given air pollution situation,” Vance Jenkins, executive secretary of the Smoke and Fumes Committee, said in a 1954 trade journal article about smog pollution. The corporate predecessors to Chevron Corp., Exxon Corp. and Royal Dutch Shell PLC were each involved in the Smoke and Fumes Committee through former companies and subsidiaries, often broken-off units of the Standard Oil corporate empire. While the documents show API learned of potential climate change risks as early as 1968 and had formed committees to examine smog pollution in the 1940s, Exxon CEO Lee Raymond said in November 1996 that climate science was unsettled. “Scientific evidence remains inconclusive as to whether human activities affect the global climate,” Raymond said at a press conference. The University of California, San Francisco, documents were cached there starting in 2002 after tobacco industry litigation. Hill & Knowlton references are heavily featured. An internal Hill & Knowlton memo from 1954 describes a booklet that employees circulated to doctors nationwide on the “cigarette-lung cancer theory.” They also show company founder John Hill, as well as colleagues Bert Goss, Richard Darrow and others, sat in on meetings of the Tobacco Industry Research Committee, an industry panel. Hill also appears in meeting minutes in the 1950s for the Manufacturing Chemists’ Association Inc. And a flyer from 1963 indicates Goss, president of Hill & Knowlton at the time, hosted an event that November about the future of public relations. An executive of Socony Mobil Oil Co. Inc., a predecessor of Mobil Oil, coordinated that talk, held at the New School in New York City. ExxonMobil’s excuse in the face of #ExxonKnew has, in part, relied on the defense that oil is not the new tobacco. At the end of the day, as Muffett points out in the video below, the final result is the same, despite who was first to devise the strategies of deception and attacking inconvenient science. It reminds me of that old “I learned it by watching you” anti-drug PSA. You’re both still busted, tobacco and oil industries. It doesn’t matter who came first. Investigative journalism has uncovered a “web of denial” in which polluting industries pay “independent” groups to disseminate misinformation to the public and policymakers. The same groups and tactics were employed first by the tobacco industry, then fossil fuel companies. Big Tobacco has been to court and lost; now it’s Big Oil’s turn. Political leaders are choosing sides in this war. Research by Inside Climate News revealed that Exxon did top notch climate science research in the late 1970s and early 1980s, which revealed the dangers its products posed via climate change. Soon thereafter, Exxon launched misinformation campaigns by funding “think tanks” and front groups to manufacture doubt about climate science and the expert consensus on human-caused global warming. Exxon wasn’t alone. Koch Industries, Peabody Energy, and other fossil companies have similarly funneled vast sums of money to these groups. Last week, Senate Democrats, including presidential candidate Bernie Sanders and vice presidential contenders Elizabeth Warren and Al Franken signed a Resolution expressing congressional disapproval of the fossil fuel industry’s misinformation campaign. 19 Senate Democrats also took to the floor of the Senate to speak out against the web of denial, with repeated references to the tobacco/fossil connections. The Committee has a responsibility to protect First Amendment rights of companies, academic institutions, scientists, and nonprofit organizations. That is why the Committee is obligated to ask for information from the attorneys general and others. In this battle of First Amendment claims, Big Oil & Coal use the same argument as Big Tobacco, who lost. Last century, we saw a similar battle with tobacco. By the 1950s, the tobacco industry knew that its products caused cancer and other diseases. They still marketed their harmful products to children, and soon created pseudo-academic institutes like the Council for Tobacco Research to cast doubt on smoking’s damage. However, the institutes’ connections to the tobacco industry were too obvious; they wanted “independent” voices. In the 1980s the Koch brothers started creating a vast web of “think tanks” that could simulate credible independence, funded via dark money, often tax-exempt. Big Tobacco eagerly joined, to “quarterback behind the scenes.” They contributed great marketing talent, some later hired by Kochs. As extensively documented at DeSmogBlog, Big Tobacco has long funded science-denying think tanks, such as the Heartland Institute, Heritage Foundation, Cato Institute, George Marshall Institute, American Legislative Exchange Council (ALEC), and Manhattan Institute, to name a few. ExxonMobil later funded these same groups. Their tactics have grown more sophisticated, for example using money anonymizers like Donors Trust to ensure their “dark money” becomes even harder to trace. The attorneys general investigating Exxon have a strong case that the fossil fuel industry is similarly guilty of racketeering by deceiving the public in order to maximize profits. Exxon and other fossil fuel companies knew of the dangers of carbon pollution more than three decades ago, and yet funneled tens of millions of dollars to think tanks that disseminate misinformation to try to convince the public and policymakers otherwise. The First Amendment defense of the fossil fuel industry by House Republicans simply doesn’t hold water. Defending the fossil fuel industry today is no different than defending the tobacco industry in the 1990s, as did Lamar Smith’s colleague “Smokey Joe” Barton (R-TX). Unsurprisingly, oil & gas is the top industry donor to Lamar Smith. History books will reflect poorly on those who sold out millions of peoples’ health for personal gain or industry profits, and on those who worked to destabilize the climate on which future generations will rely for the sake of their own political power or ExxonMobil’s record profits. It’s impossible for fossil fuel executives to get some damn peace and quiet. At its annual shareholder meeting in Dallas, Texas, Exxon Mobil faced investors’ demands that the company get serious about climate change adaptation and regulation. Since 1997, Exxon Mobil has fended off similar demands from its shareholders, but not at this scale. Wednesday’s meeting included the largest coalition of climate-activist investors yet of two-dozen large shareholders representing $8 trillion under management. But eight of the nine climate shareholder resolutions still failed. The one proposal that passed, at 62 percent of the vote, allows shareholders who hold 3 percent or more of the company’s shares for more than three years to nominate up to a quarter of the board’s directors every year. In theory, this could allow for a climate activist to become a director at the company. One climate resolution that failed suggested a company report on how climate policies would impact its business. It was the second-most popular resolution, yet earned just 38 percent of the vote. Other proposals included calls for more transparency on Exxon’s hydraulic fracturing activities, lobbying, diversity and makeup of the board, and its plans to adapt to a renewable energy economy. The shareholder resolutions came from the New York City’s comptroller’s office, religious groups, and investing firms demanding the company prepare for a future of climate change regulations. “Many of the world’s largest investors are voting against the [Exxon] management today,” said Edward Mason, head of responsible investing for the Church of England. The board recommended to deny all proposals presented. “For many years now, ExxonMobil has held the view that the risks of climate change are serious, and do warrant thoughtful action,” said Exxon CEO and chair Rex Tillerson during the shareholder’s call Wednesday morning. But asked to cut the company’s ties with groups promoting climate denial, such as the American Legislative Exchange Council (ALEC), Tillerson declined. All the while, the company insisted it’s serious about climate change, touting its three-decade commitment to climate research in a slide shown below. Tillerson left some things unsaid: While the company internally recognized manmade climate change as real, it advocated for skepticism publicly. Oil giants have faced growing pressure to acknowledge climate change — both Royal Dutch Shell and BP passed similar resolutions last year. Chevron also voted on shareholder demands on climate on Wednesday. Though Exxon remains firm, it will see continued pressure from activists and worried investors. Outside the meeting in Dallas, climate activists swarmed, demanding that the company change its ways. Ted Wells, an attorney hired by ExxonMobil to represent the company against accusations it lied about the climate risks of burning fossil fuels, also represented the tobacco industry in the lawsuit brought by the U.S. Department of Justice in 1999 under the Racketeer Influenced and Corrupt Organizations (RICO) Act, DeSmog has found. Wells also defended the National Football League (NFL) in the infamous “Deflategate” matter as well as in litigation over the far more serious issue of concussions. Wells has represented ExxonMobil since at least December 2015, following New York Attorney General Eric Schneiderman’s announcement that his office would probe Exxon’s role in funding climate change denial despite its long-held understanding and pioneering research into climate change. Wells’ name also appears on an April 13 legal filing Exxon submitted in response to a subpoena issued by the Virgin Islands’AG Office, a sign the “private empire” has retained him for the wider probe being carried out by a group pf Attorneys General. Wells has made a career out of working on behalf of clients with legal claims often flying in the face of well-established science, with legal industry trade publication Inside Counsel referring to him as a top attorney-for-hire for crisis situations in an April 2007 article. A DeSmog investigation has also found parallels in legal and public relations defense tactics deployed by Wells on behalf of those past clients and the tactics currently being utilized for his current big-ticket client, ExxonMobil. Naomi Oreskes, a Harvard historian of science who has long studied the denial industry and wrote the indispensable book “Merchants of Doubt: How a Handful of Scientists Obscured the Truth on Issues from Tobacco Smoke to Global Warming,” sees Exxon’s hire of Wells as a positive and as a potential sign the company sees the writing on the wall. This is far from the first prominent lawsuit for which Wells has offered his billable services to Exxon, a company which funded climate denial to the tune of $31 million, by conservative estimates, between 1998 and 2014. In the early 2000’s, Wells counseled ExxonMobil in a federal corruption case, with an ex-Mobil official named J. Bryan Williams pleading guilty to tax evasion and conspiracy as part of corruption that was at the time endemic in Kazakhstan. Wells, too, provided legal representation to Exxon in the lawsuit filed against it by citizens of Indonesia who alleged they had been tortured by private security guards on the company payroll. That case, which reached the U.S. Court of Appeals, became somewhat moot when the U.S. Supreme Court ruled in the Kiobel v. Royal Dutch Petroleum case that the Alien Tort Statute does not offer non-U.S. citizen victims of human rights abuses committed abroad by U.S.-based corporations a path to legal justice in U.S. courts. More recently, Wells represented Exxon in New Jersey in a lawsuit filed against the company by the State of New Jersey in 2004, which alleged the corporation’s responsibility for rampant statewide pollution. This culminated in an August 2015 $225 million settlement, far less than the $8.9 billion asked for by the plaintiffs. Yet for most of the U.S. population, Wells is best known for the “tough guy” role he has played in the “DeflateGate” case on behalf of the National Football League (NFL). It turns out that story, like Exxon and like the tobacco wars, has an anti-science spin too. In that case, famed New England Patriots quarterback Tom Brady faces a four-game NFL suspension for allegedly deflating footballs in a 2015 playoff game against the Indianapolis Colts in order to gain a competitive edge. Wells has provided theNFL with legal representation for the ongoing saga. But contrary to the NFL‘s crackdown on cheating narrative, the science points to the fact that Brady and the Patriots actually may not have cheated. It all centers around what is known as the “Wells Report” — an investigation by Ted Wells of the allegedly deflated footballs. That report’s findings have come under question by numerous scientists, the NFL Players Association (NFLPA) and even the conservative think tank American Enterprise Institute. The most ardent criticism of the study centers around the scientific report outsourced to a firm called Exponent Inc. that the Wells Report relies upon to make its case. The tobacco industry also used Exponent Inc. research to claim secondhand smoke does not cause cancer. “The first thing you know is that when Exponent is brought in to help a company, that company is in big trouble,” Cindy Gage, owner of an environmental and agricultural consulting firm in California, told the Los Angeles Times in 2010. While Wells represented the NFL for “DeflateGate,” he also provided his legal services for the much more scandalous — from a human health and public interest perspective — concussion lawsuit the NFL faced, brought against it by over 4,800 former players. That lawsuit ended with a $1 billion settlement, which some players have appealed, and some have pointed to as being rife with loopholes allowing the NFL to get out of trouble on-the-cheap. to the article in a letter published by Politico. Just over a decade ago, Wells went to bat for Philip Morris in the United States v. Philip Morris lawsuit filed against the company by the DOJ in a case ending with a prosecution, but with actual penalties tantamount to kid glove treatment. The treatment, which came from DOJ political appointees, motivated lead DOJ prosecutor for the case Sharon Eubanks to resign from her post. In court documents reviewed by DeSmog, Wells’ tobacco arguments parallel, in many ways, those Wells made for Exxon in its April 13 response to the Virgin Islands’ subpoena. Much of that line of argumentation over a decade ago in the tobacco case centered around proving or disproving that Philip Morris would likely commit fraud in the future if left unprosecuted, a key tenet of a successful RICO prosecution. 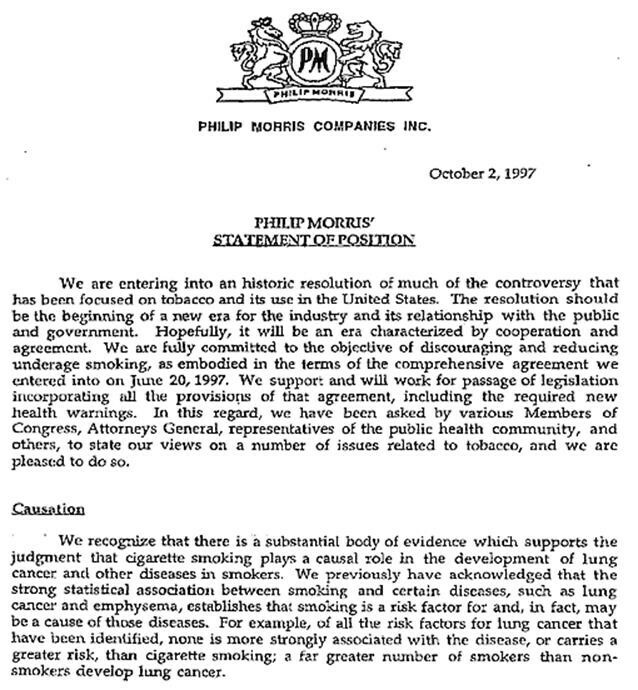 Throughout the tobacco RICO case, in legal filings and in the courtroom, Wells emphasized how Philip Morris’ behavior had changed and how it had become more a socially responsible corporate entity. In the main, Wells said Philip Morris had done so by withdrawing from the industry-manufactured debate on smoking as it relates to health and addiction, as well as by deferring to the judgment of the public health community on smoking’s human health impacts. As a document obtained from University of California-San Francisco’s (UCSF) Legacy Tobacco Documents Library details, Wells cross-examined Philip Morris’ “point person“ — General Counsel Denise Keane — about its public relations website. That site attempted to convey that the company no longer participated in the scientific denial of tobacco’s human health impacts. 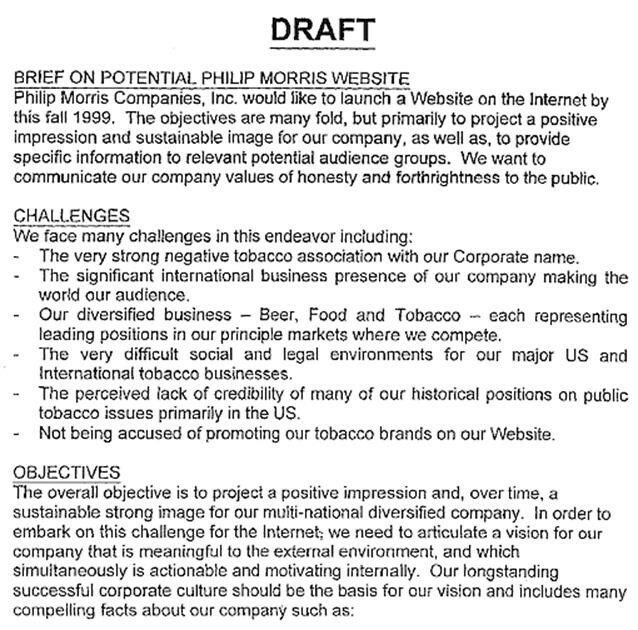 But first and foremost, it appears the website existed for Philip Morris’s public relations purposes. A 2008 academic paper published in the journal Public Health Nursing by Ruth Malone and Elizabeth Smith, both professors at UCSF, concluded the website’s existence did not signify any sort of radical shift in company culture on public health. That paper cites a June 1999 memorandum published in the UCSF tobacco archives, which describes the rationale behind the website. ExxonMobil currently appears to be positioning itself as having moved away from the “old world,” announcing it would be hiring a new climate change researcher in the midst of New York Attorney General Eric Schneiderman announcing his office had opened an investigation on Exxon. A similar notion of involvement in public policy “debate” before it had reached an overwhelming scientific consensus arose in Exxon’s response to the Virgin Islands’ subpoena signed off on by Wells on April 13, with the word “debate” used 11 times by the company’s legal team. Like with the Philip Morris precursor, Wells and the Exxon legal team attempted to convey the company’s shift from student of climate change science, to funder of climate denial and attacks on science, and then the shift back again to being a responsible corporate citizen concerned about climate change impacts and policy solutions. “ExxonMobil has publicly and repeatedly acknowledged risks related to climate change” in recent years, Wells and his legal team wrote in response to the Virgin Islands’ AG Office subpoena, citing three example of such acknowledgment in recent years. In so doing, Exxon also claimed the Virgin Islands’ AG Office had launched an attack on its free speech rights and its ability to take part in such debates in earlier years. “The chilling effect of this inquiry, which discriminates based on viewpoint to target one side of an ongoing policy debate, strikes at protected speech at the core of the First Amendment,” wrote Wells and the Exxon legal team. Numerous conservative groups — some with ties to the climate change denial echo chamber such as Koch-funded groups like Competitive Enterprise Institute, Pacific Legal Foundation, and Heritage Foundation — have also called the Virgin Islands subpoena a First Amendment attack. So too did the editorial boards of the Wall Street Journal and the National Review Magazine. The Free Speech in Science Project, a group whose funding stream has yet to be revealed, has also pushed a First Amendment argument. The tobacco industry is now infamous for writing in a 1969 memo that “Doubt is our product since it is the best means of competing with the ‘body of fact’ that exists in the mind of the general public.” Yet, Exxon has even said in its own late 1970s studies that “there is no doubt” that pumping carbon dioxide into the atmosphere was harmful. If doubt is the product, then Wells has produced a legal career representing and defending doubt — from the tobacco wars, through to the NFL‘s concussion crisis and now into today’s “ExxonKnew” saga. Wells did not respond to multiple requests for comment for this article. This piece first appeared at DeSmogBlog.